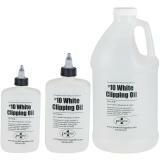 Clipping oil for all clipping and shearing work. New! Applicator bottles now have open/close screw tops to help eliminate leakage! For all clipping or shearing work. 4 and 8 oz. bottles have screw tops, which helps eliminate leakage and is convenient to use. 1/2 gallon jug is for refilling small bottles. 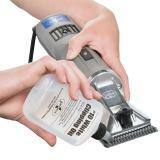 Proven to keep blades and combs & cutters cooler than other oils. 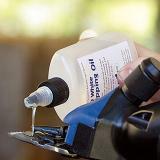 Oil is clear to reduce risk of stain to fibers. Apply 3 to 5 drops to teeth of blades, combs & cutters every 2 to 3 min. 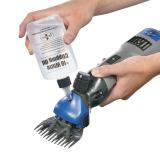 Has a high torque, rare-earth, permanent magnet 110 volt motor that glides through dense wool and hair. Works great, but the bottle leaked during shipping and was only 3/4 full. Great value and product. Service can't be beat!! 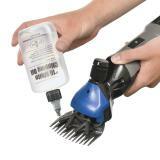 Great Product I use it when shearing all year round. I am new to shearing but knew I would be using the recommended oil that came with my Premier Shearer. A nice light oil that keep the shearer (and myself) going with no staining or smell. I have tried other oils in the past for my shears but nothing keeps them as clean and well lubricated as Premier's Shearing Oil. Other oils have allowed my blades to tarnish and rust over the course of just one season. This oil keeps them looking new year after year. I will always keep a half gallon on hand.